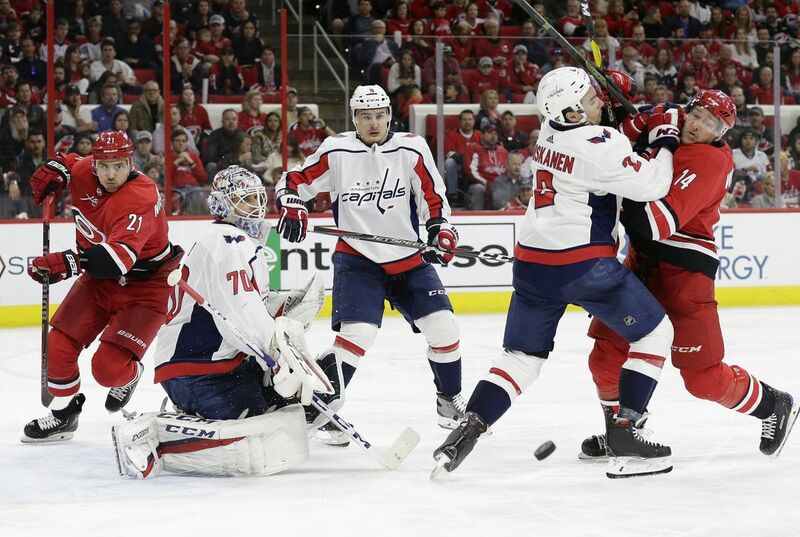 The Washington Capitals are in Hurricanes territory for Game 3 on Monday night (7 PM ET, NBC Sports Washington locally or CNBC) at PNC Arena in Raleigh. They were victorious in Game 2 at Capital One Arena on Saturday, as beating the Hurricanes 4-3 in overtime, thanks to defenseman Brooks Orpik. After 2 games, the Capitals lead 2-0 in the first round series with four points in the playoffs. Capitals’ center Nicklas Backstrom has recorded four points, which include three goals, in two games. He leads Washington in points and in goals. Other forwards who have scored are captain Alex Ovechkin, center Lars Eller, and right wings T.J. Oshie and Tom Wilson. Defenseman John Carlson and center Evgeny Kuznetsov both have picked up three assists. Hurricanes’ right wing and rookie Andrei Svechnikov has already scored two goals and had an assist in his playoff debut. He and center Lucas Wallmark tie for points (3) for Carolina; the latter getting one goal and two assists in the past two games. Centers Jordan Staal and Sebastian Aho have also picked up a goal. Collecting two assists respectively, Wallmark leads along with defensemen Dougie Hamilton and Jaccob Slavin. Captain and former Capitals player Justin Williams has only one assist. Washington Capitals’ goaltender Braden Holtby has been hot in the first two games. He is 2-0 and has a .912 save percentage. With goals against average of 2.46, Holtby has allowed five goals and has made 52 saves. The Capitals recalled goaltender Vitek Vanecek from their AHL affiliate, Hershey Bears, on Sunday as the third netminder. Washington re-assigned Bears’ goalie Ilya Samsonov back to Hershey. Petr Mrazek is 0-2 so far this post-season. The Carolina Hurricanes goaltender has a save percentage of .860 with goals against average sitting at 3.50. Mrazek made 43 saves and allowed seven goals in the last two games. The Capitals’ playoff power play has been 25% effective, making it 5% better than the New York Islanders’ power play. Backstrom and Ovechkin have each scored on the advantages. Washington ties with the Islanders on penalty kill efficiency, which is 87.5%. Both Oshie and center Nic Dowd have four penalty minutes. In just two playoff games, the Hurricanes have a 12.5% proficiency on power plays. Staal has recorded the only power play goal for Carolina thus far. When they are a man down, the penalty kill is 75% effective. Left wing Micheal Ferland leads the Canes with 14 penalty minutes. The Washington Capitals’ face-off win percentage is 39.5%, which places them 14th in post-season play. Dowd has the highest percentage among the Capitals (53.9%). For Carolina, they have a face-off win percentage of 60.5%. This ties them with the Western Conference Nashville Predators in the top three. Center Greg McKegg has a 100% win percentage in face-offs for the Hurricanes. This entry was posted in News and tagged 2019 NHL Stanley Cup Playoffs, Carolina Hurricanes, Della Young, Washington Capitals. Bookmark the permalink.